Public support "the right to vote at 16" more than "reducing the voting age from 18 to 16"
May 23, 2018, 10:10 a.m. The issue of the voting age was reinvigorated by the 2014 Scottish independence referendum, in which 16 year olds were given the right to vote for the first time in the UK. From that point onwards, 16 year olds living in Scotland have been able to vote in local elections and in elections to the Scottish Parliament. Subsequently, the Welsh Assembly announced plans to extend the franchise to 16 year olds in local elections in Wales. Those looking to change the law usually frame the argument in two ways: they either talk about reducing the voting age or giving 16 and 17 year-olds the right to vote. But which argument has more power with the public? 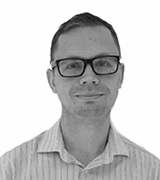 We looked into it, building on previous work carried out by Ipsos MORI. When the public are asked about giving 16 and 17 year olds the right to vote, 34% support the idea and 45% oppose it. When it comes to reducing the voting age, 24% believe it should come down while over half (51%) think it should not. 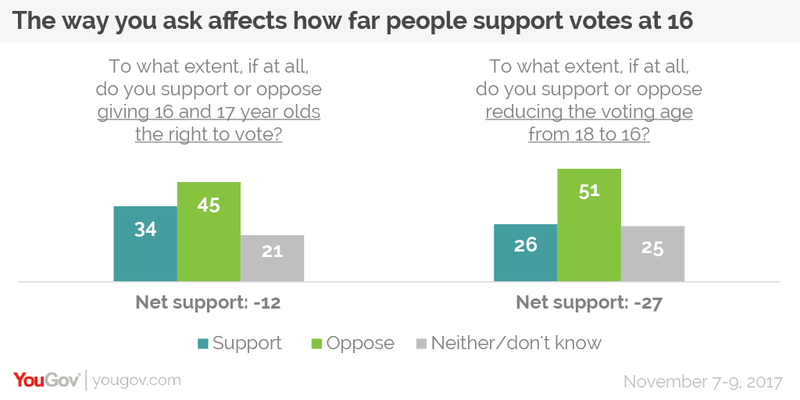 This suggests that if the debate around votes at 16 focuses on giving rights rather than reducing the voting age then the public are more likely to be supportive. However, other factors that could influence public opinion should also be taken into account. For instance, it is likely that the debate about voting at 16 will consider the other legal rights that people are given at different ages. To see the impact this might have we asked the public about giving 16 year olds the right to buy alcohol, and the right to marry without parental consent, before asking them about votes at 16. We also checked to see how support was affected by using the ‘giving rights’ vs ‘reducing the voting age’ language, and by the order in which the arguments were mentioned. Overall, support is higher when using the ‘giving rights’ language instead of the ‘reducing the voting age’ wording. When we simply ask whether people support reducing the voting age to 16, 24% support it. However, if we first quiz people about 16 year-olds being granted various rights and then ask about younger people being given the right to vote, 35% back it. How and where the question is posed produces an 11 percentage point difference in support for votes at 16. This observation holds true even when accounting for other factors that influence public opinion – such as age and voting behaviour. However, these factors still have a stronger influence on the level of support for votes at 16 than whether or not the ‘giving rights’ language is used. Regardless of how the question is asked, there is no public majority for allowing 16 year olds to vote, so those who favour extending the franchise have an uphill battle to convince the public of their case. However, our research indicates that if supporters can centre the debate on rights then they might make some headway.